If you abide by the belief that rules exist for a reason, then maybe you don’t need any explanation of why the AP (Associated Press) Style Guide matters. But for the writer who has ever rolled his eyes while reaching for their guidebook to look up the AP rule, or received an editor’s red pen note to “check AP,” then AP Style can feel more like a rulebook than a guide. First, if you intend to work as a journalist, then this book matters simply because your career matters. End of argument! However, a more detailed explanation shows that this book really exists for the sake of consistency in writing for the public. When everyone – or at least every writer – uses the same grammar, punctuation, abbreviations, numbers, etc., it ensures that messages are communicated in a consistent style. This consistency delivers conciseness, correctness and clarity. In a World Wide Web environment where more people than ever are becoming writers, it isn’t hard to see how some consistency could be key to navigating the mass amount of writings available at our fingertips. AP Style helps us write articles that people can easily read without having to adjust to a new writer’s style. Because most newspapers use the AP Style Guide, readers are accustomed to this universal style of writing. A simple adjustment to a new writer’s “voice” can be enough newness without having to stop and wonder what that writer’s new abbreviation is supposed to represent. 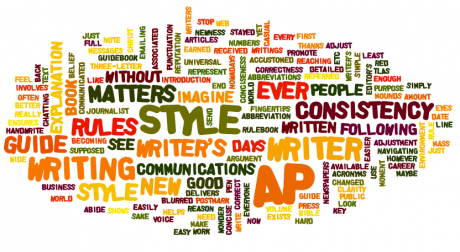 Often referred to as “The Writer’s Bible,” the AP Style Guide has earned its reputation. While it doesn’t date back to the days of Christ, it was around before our text messaging full of TLAs (three-letter acronyms). It was here before the days that blurred the line between casual and business writing (thanks to the introduction of mounds of emailing, chatting, and written communications that are easier to send than ever). Just imagine for a moment the volume of written communications nowadays; now, imagine you had to handwrite and postmark each of those and it is easy to see just how our world has changed. Yet the purpose of this manual has stayed the same: to promote good, concise, correct writing! Being a good writer involves more than following the rules, but following the rules will make you a better writer. I used to wonder why they couldn’t pick just one way to teach us in school- as we had to learn MLA and APA style. Is the APA the more popular style now? I have used AP style since the beginning. It is organized and concise. I am appalled when I see the way people write now…and call it journalism.